Walt Whitman. Colonel Zadok Magruder. Albert Einstein. Walter Johnson. Richard Montgomery. Thomas S. Wootton. These men are namesakes of MCPS high schools—and they’re also all white. While they might have represented MCPS students when those schools were first founded, some students, like Einstein High School freshman Hari Iyer, believe that’s no longer the case. Iyer launched a petition on Change.org Jan. 27 to rename Winston Churchill High School after Malcolm X. Thus far, students have met the petition with varying levels of interest. MCPS has a complicated history regarding racial diversity; when the school system first opened in 1860, it was an education system exclusively for white students. The system for students of color was established in 1872 and remained segregated until 1954, when the county began integrating. Yet even with efforts for integration, MCPS has a predominantly white history: in 1970, 91.6 percent of enrolled students were white. But in 2000, minority groups surpassed the white population, which dropped to 49 percent. Today, 37 percent of the MCPS student population is white; 63 percent of students are of minority races, and this percentage continues to grow. 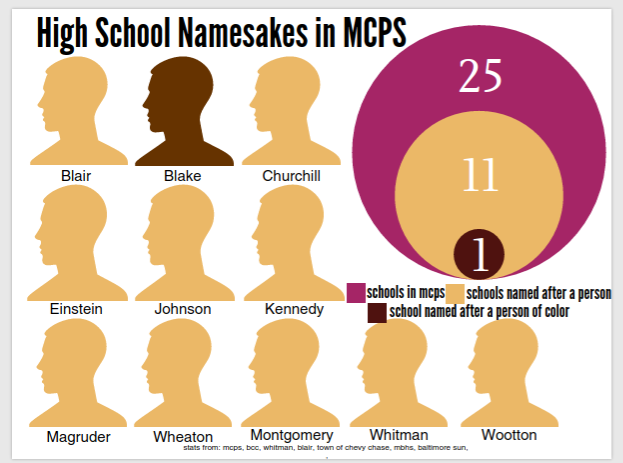 Despite MCPS’ diversifying student body, of the 11 high schools in the county named after people, only one is named for someone of color: James Hubert Blake. Driven partly because of this lack of diversity, Iyer seeks to rename Churchill High School, named for British Prime Minister Winston Churchill. While Churchill is widely admired in the Western world for his leadership in World War II, the petition, which has 68 supporters so far, denounces him as xenophobic for his support of brutal segregative policies upholding white supremacy in Africa and the Americas. By contrast, Iyer argues that history classes too often characterize Malcolm X as a violent oppositionist, rather than commemorating him properly for his role in the Civil Rights movement. Naming a high school after Malcolm X would be especially powerful in light of continued prejudice against minorities, especially Muslims, Iyer claims in the petition. Iyer isn’t alone in his criticism of MCPS namesakes; a recent article penned by historian David Rotenstein in The Washington Post March 5 found fault with the namesake of Colonel E. Brooke Lee Middle School. While Lee played a pivotal role in developing Silver Spring, Rotenstein points out that he was equally responsible for the discriminatory policies that prevented African-Americans from living in his newly created suburbs. Iyer and Rotenstein highlight a controversial question: to what extent should historical figures be condemned for holding these racist viewpoints if they were considered the norm in the past? For sophomore Lucas Sturla, renaming Churchill High School seems excessive. In a lot of my classes, I’m the only black person in the room. And so in history class, when we talk about slavery, people don’t know how to look at me. 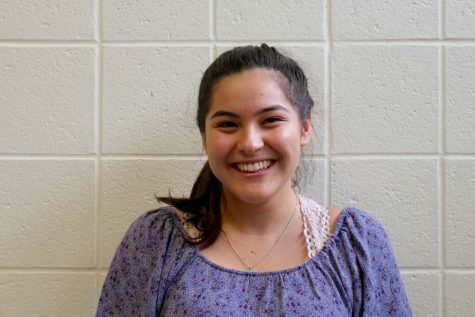 But sophomore Sydney Johnson says the problem isn’t just Churchill High School, but rather how historical figures are idolized without considering their negative attributes. Johnson warned that doing so, especially in schools, can have an impact on young minority students’ identities. “When they want to know about the person their school is named after, and then they find out they’re not really supportive of their minority group, it’s kind of discouraging,” Johnson said. Iyer’s push to rename Churchill High School mirrors a nationwide trend of renaming buildings in order to remove the names of xenophobic historical figures or to commemorate minorities who have been lost to history. This trend is especially prevalent on college campuses; recently, Yale University renamed Calhoun College—a residential college of the university originally named for vice president and avid defender of slavery, John C. Calhoun—after computer scientist Grace Hopper. Junior Christiana Turay, founder of Whitman’s Black Student Union, believes that changing the school name may be logistically complicated. Instead, MCPS should focus on actively working to diversify the narrative and scope of their history lessons to acknowledge all perspectives, she said.